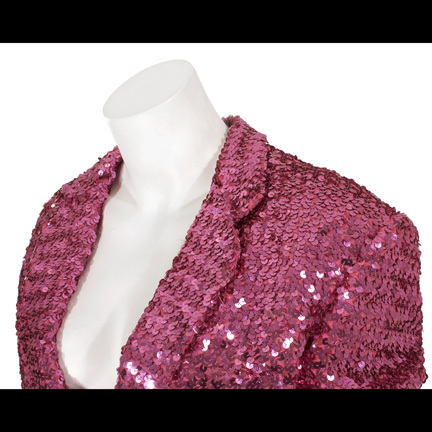 This jacket was worn by Dale Bozzio, lead singer of the band Missing Persons, at the 1984 MTV Music Awards held at the historic Radio City Music Hall in New York City. 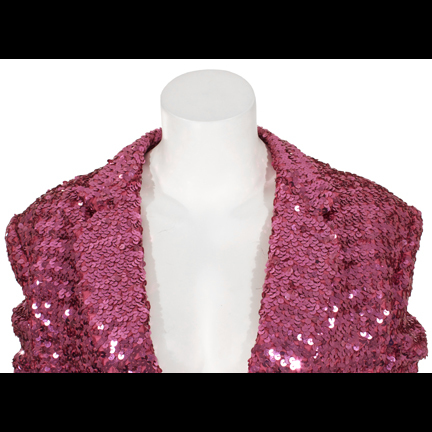 This item was acquired directly from Debra Messana, who worked as Bozzio’s personal assistant for several years beginning in 2002, and received this iconic wardrobe piece from her as a gift in appreciation of her services. 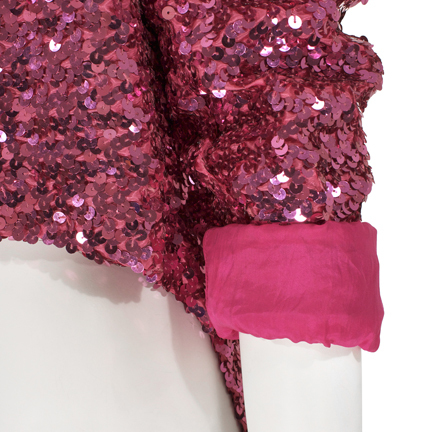 The jacket is constructed of pink sequined material and is lined with a matching pink satin lining and ¾ rolled cuffs. 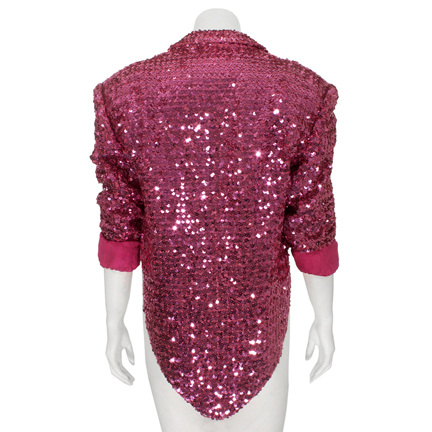 Dale Bozzio wore this jacket as part of a matching pink ensemble to the first annual MTV Music Awards in 1984. Bozzio presented the award for Most Experimental Music Video to musician Herbie Hancock for his video of the song “Rockit”, which swept the awards that year. Bozzio was also featured wearing the jacket in several publicity photographs taken at the event. Bozzio later modified the jacket to wear at subsequent appearances and concert performances following the MTV Awards. Dale often cut and altered her garments for re-use in order to keep her wardrobe and style constantly changing, and converted the long jacket into a short tailcoat after its use on the awards show. 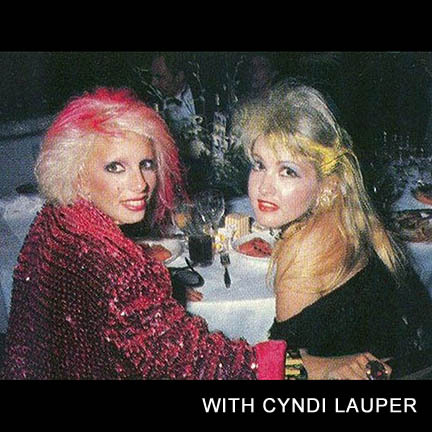 As one of the most enigmatic female front persons from the history of Rock, Dale Bozzio’s signature look and style continues to fascinate and influence contemporary entertainers. 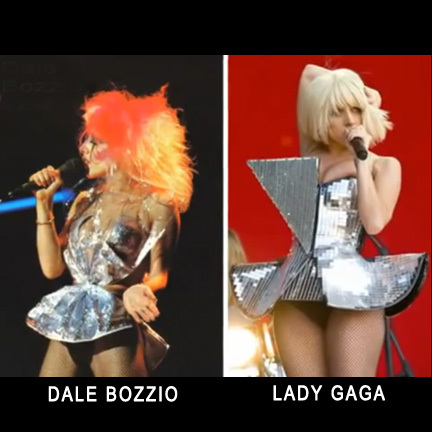 Vocal comparisons have been made between Bozzio’s style and that of Gwen Stefani, and Lady Gaga’s eclectic wardrobe and costume design is an obvious homage to Bozzio’s trademark image. Her iconic look is epitomized by this jacket and other eccentric designs, proving that her fashion, creativity, and talent still has an impact on American Popular Culture today. The garment is in very good condition and is accompanied by signed certification from Debra Messana.